Greetings from Helsinki! It is the time of the year to take a bit of a breather between the seasons! We’re back from our 14th season in Nepal and remaining at low-lands ’til late January. We are not keeping ourselves unemployed, though. At Aventura we are working on the new catalogue which also pulls together programs on all our next year’s treks. Altitude Junkies’ are already preparing arrangements and gearing up for next year’s Mt. Everest expedition. For enquiries, please email Phil Crampton at info@altitudejunkies.com or me at samuli@samulimansikka.com. I myself am trying to figure out next year’s schedules which is not at all a simple task! So many places to visit, so many beautiful treks to lead, so many peaks to climb, so many options for next year and so very little time! Anyway and first of all, the spring-season will start off with Helsinki International Travel Fair on January 16th ’til 19th. Please come over for a chat at Aventura stand. Starting on January 29th I will be leading Aventura’s trip to Mount Kenya and Kilimanjaro. This will be my 8th time guiding on Kilimanjaro having tracked a 97,5 % success rate to Uhuru peak and the remaining 2,5 % to crater rim. You won’t find any better changes to summit! Please get yourself familiar with the program and sign-up quickly as we only have a couple spots left! At the moment I am awaiting for the icefalls to start building up. For many years I haven’t really had time to do much climbing in Finland or in the Alps but I am hoping to get ”back on the saddle”. March will thus be in the Alps in Chamonix for a week or two. I have not yet settled on anything for the coming spring but I bet there will be interesting projects to take on! Please do check on here and follow us on Twitter to get the latest news on upcoming trips! In the meanwhile, make sure to follow our friend David Göttler’s attempt on first winter ascent of Nanga Parbat! Greetings from Kathmandu! It is very exciting being here right now as it is soon to be the election day! Nepal is going through interesting times and everyone’s anxious to see how the new election commission will be! We are now finalizing our autumn trekking season and soon returning home to Finland! We just arrived from Hinku Valley and Mera Peak where we summitted in clear although cold conditions last Saturday! Please see the enclosed photo of one of the team members descending from the summit (6441m.)! It’s been a long season here as we started on Annapurna Circuit already in September. After that we did a Annapurna Basecamp trek followed by the latest being the Mera Peak climb. Look forward to see lot of photos added on this website very shortly! Please do remember that all the GPS-tracks will also be added for you to help planning your Nepal-trek. Summitclimb summitted Baruntse on first week of November! 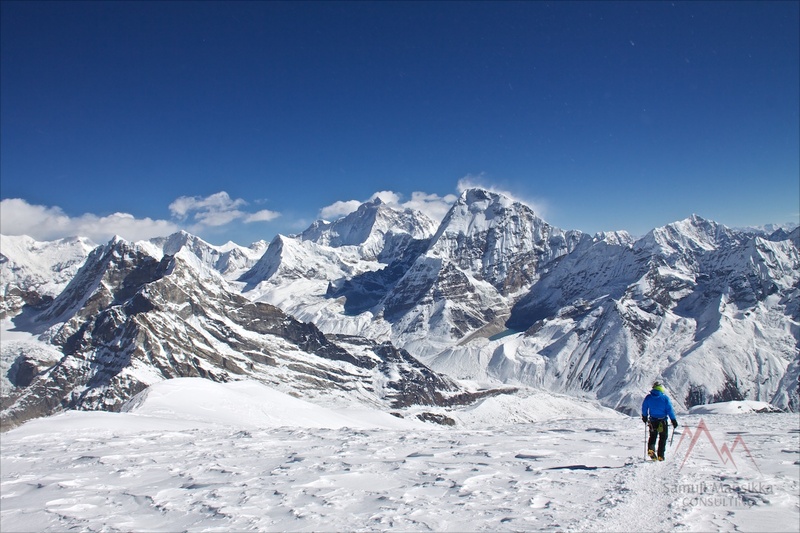 Ama Dablam proved to be tricky this season due to unusual amounts of snow. Altitude Junkies are at home in New York although the Kathmandu staff is getting things sorted for next spring’s Everest expedition! It is not too early for you to start planning on next spring’s climbs! Both Junkies and Summitclimb offer Mount Everest expeditions in April-May. Also check on Junkies’ awesome Peru programs for next summer! I myself am reserving some time for more personal climbs next year! We do not yet know for sure what is going to be up, but I bet you it’ll be interesting no matter which one of the options we end up taking on! We are also returning to the European Alps which I’ve always considered my favourite range in the World! It’s going to be a fun two weeks in Chamonix in March! My next trip leading will be Aventura’s Mount Kenya & Kilimanjaro (Rongai) trek starting on January 29th! Please do go through the itinerary here and sign up! We already have the trip confirmed! I can assure you that you won’t get better changes to summit with any other operator in Finland! Our success rate throughout our Kilimanjaro history is 97,5 % to Uhuru Peak and the remaining 2,5 % to either Gilman’s Point or Stella Point! Add some safari and/or Zanzibar to this and you will have a vacation of a lifetime! Do find us also on Twitter! Now get yourself ready for the upcoming ice-climbing season and start getting yourself in shape for big projects next year! We are here to help you get to the mountains!